Hello there SCS stampers. Barbara here, and I am so glad you stopped by today. This month, we are being sponsored by Ecstasy Crafts, a fabulous company with some of the most gorgeous products. The best part is we get to combine their products with Sin City Stamps products. 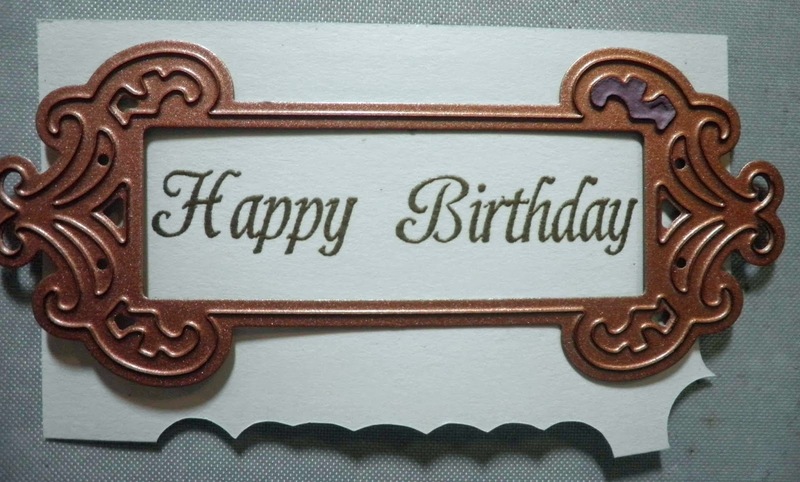 For my first project, I made this beautiful birthday easel card. 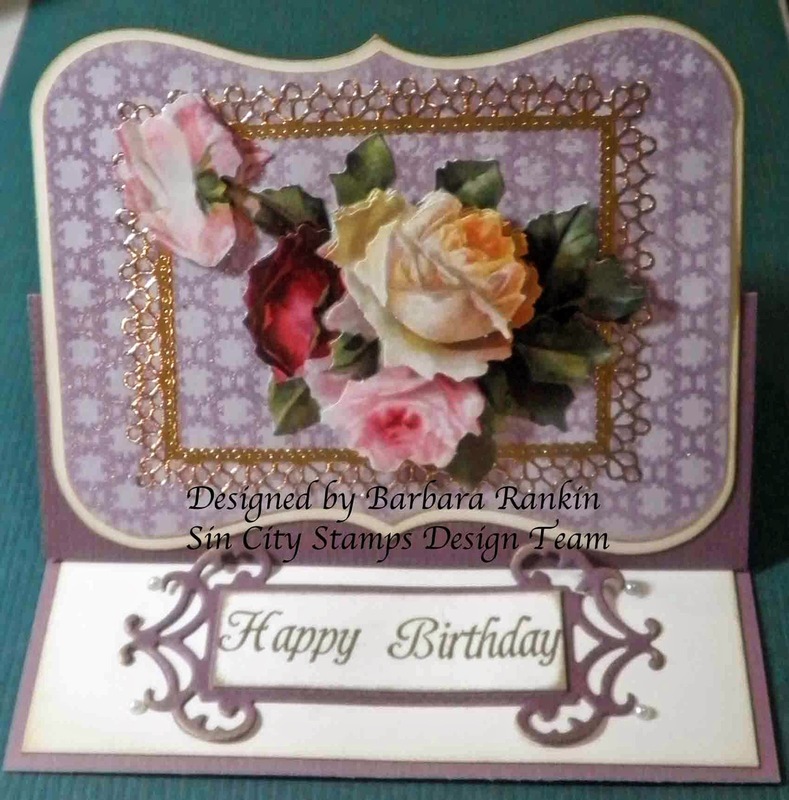 Easel cards are so simple to make, yet really make a statement when the recipient can sit it out for display without it falling over. 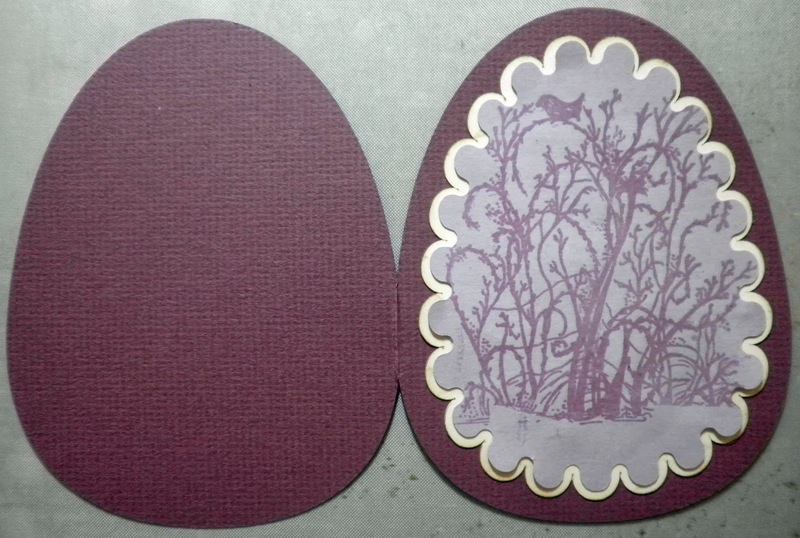 I used my Silhouette to cut out this card, but you can also cut Vineyard cardstock to measure 5-1/2" x 8 -1/2". Score at 4-1/4" and 6-3/8". 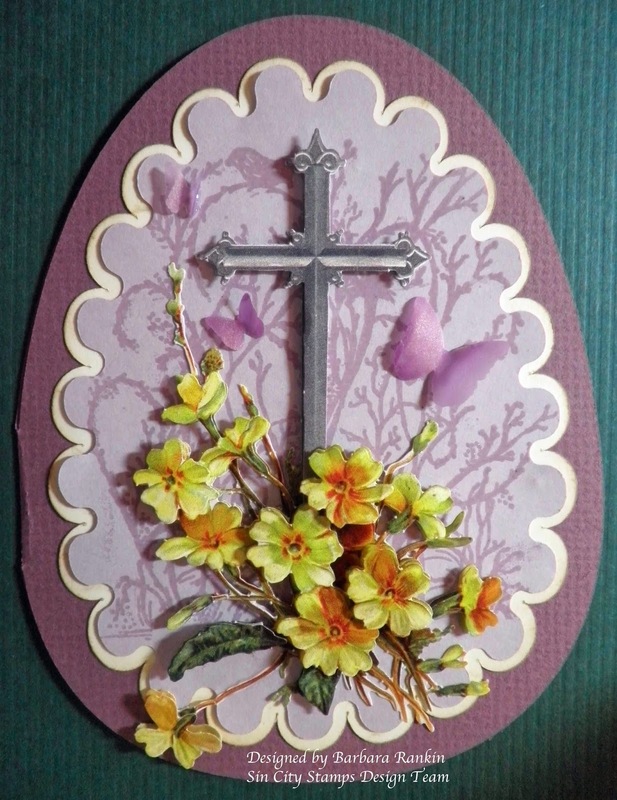 I also used my Silhouette to cut the layers for the card. 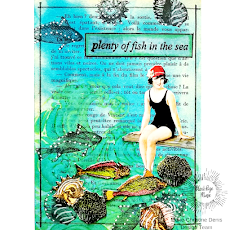 You can use any similar die cuts you have, or cut pieces of cardstock slightly smaller than card front, in 1/8" increments, and either leave as a rectangle or punch corners with a decorative punch. Use what you have. It is easy. Distress edges with Old Paper distress ink. 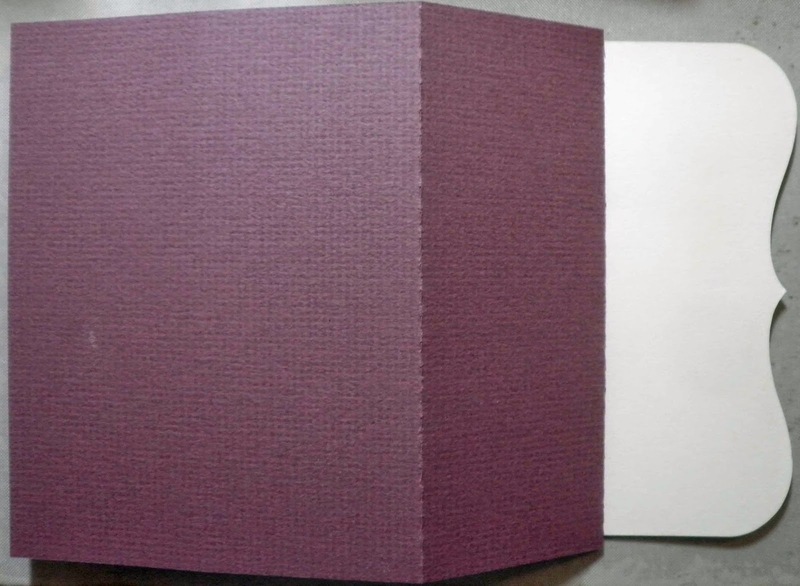 Center the Ivory layer over the card front and carefully fold back the card base at the 6-3/8" score line. 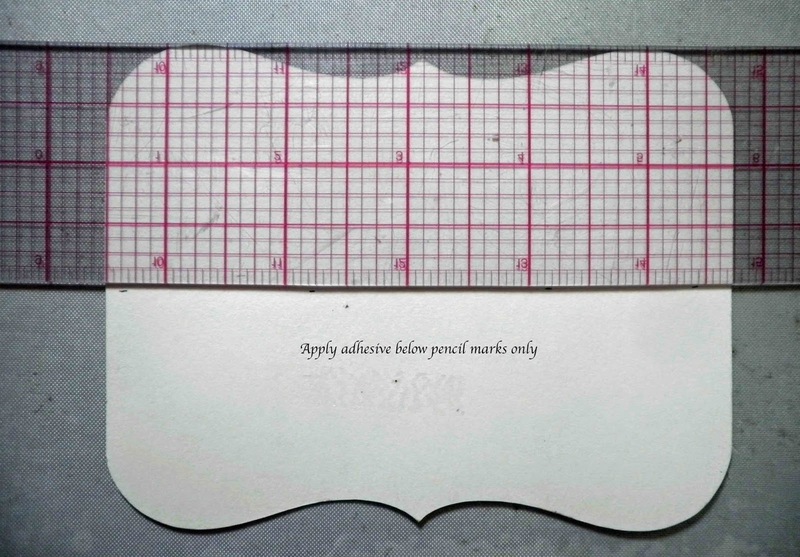 Use a pencil to mark center line. Apply adhesive to the bottom half of the Ivory layer. 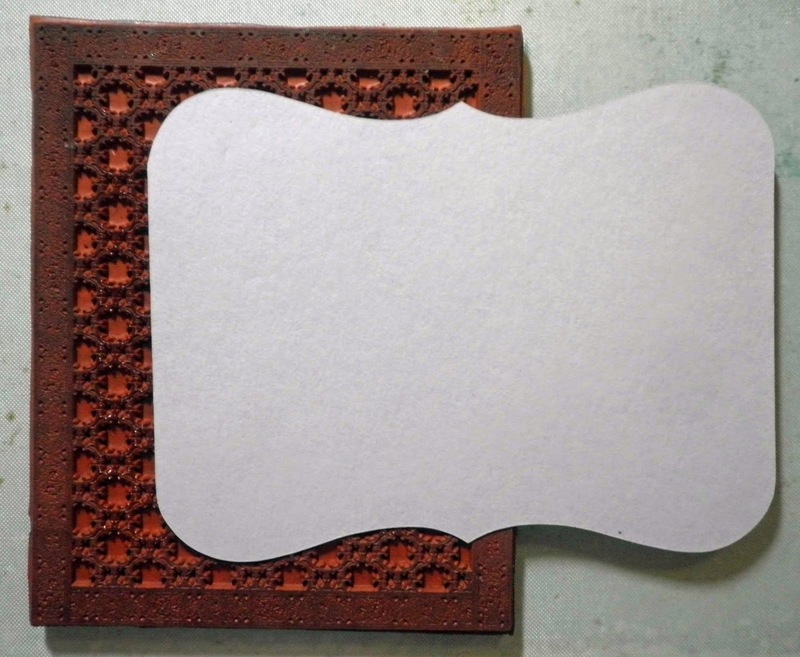 You will adhere only the bottom half of the Ivory layer. Ink up only the center of the Metal Madness background stamp with Versamark ink. I left the borders uninked. 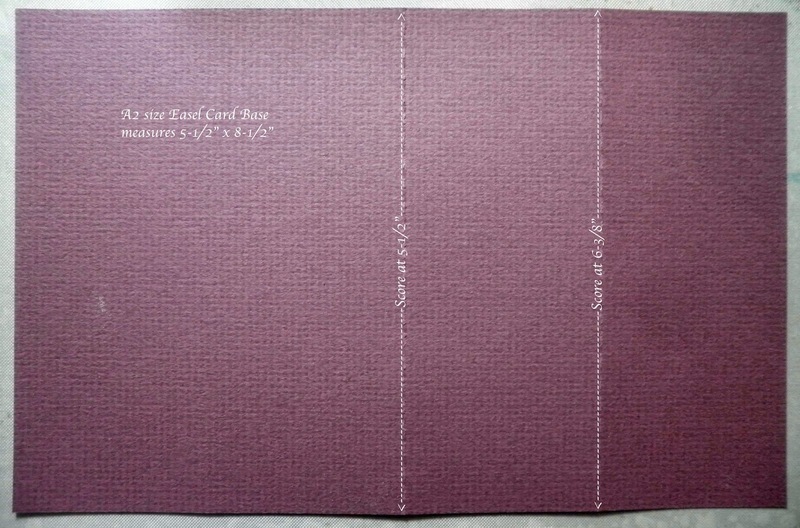 Lay half of the layer over the inked stamp and burnish with your fingers. Then do the opposite side to fill in. 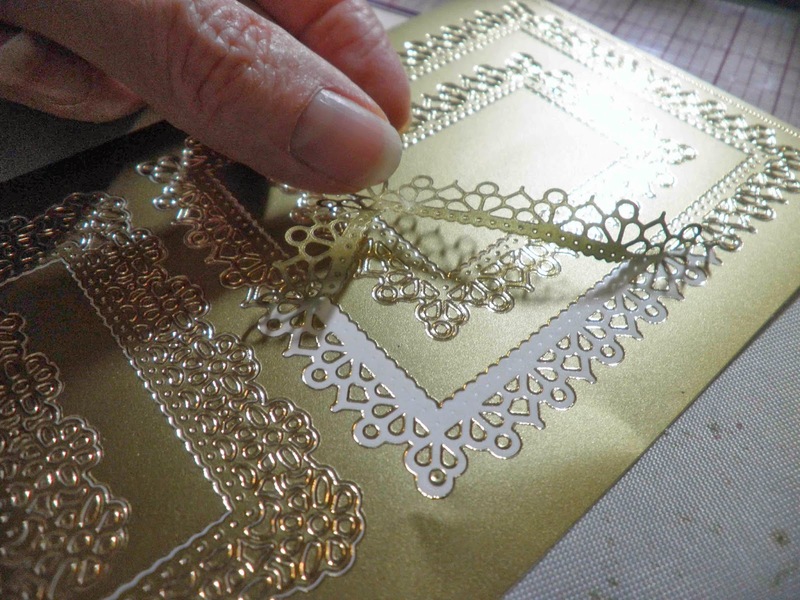 Peel off gold frame sticker, keeping the sticker close to the paper while peeling it off. 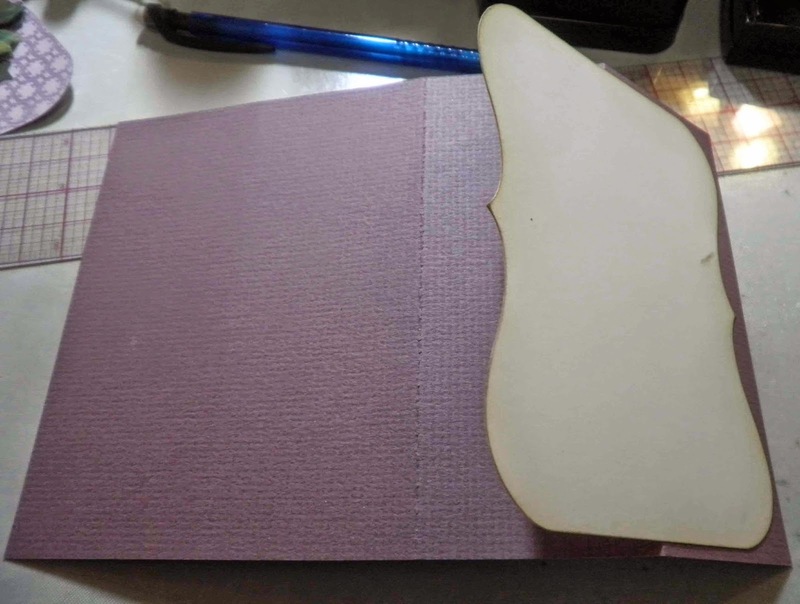 This helps avoid pulling up the tiny cut out pieces, which will remain on the sticker paper and can be used, too. I will show you this in my next post. 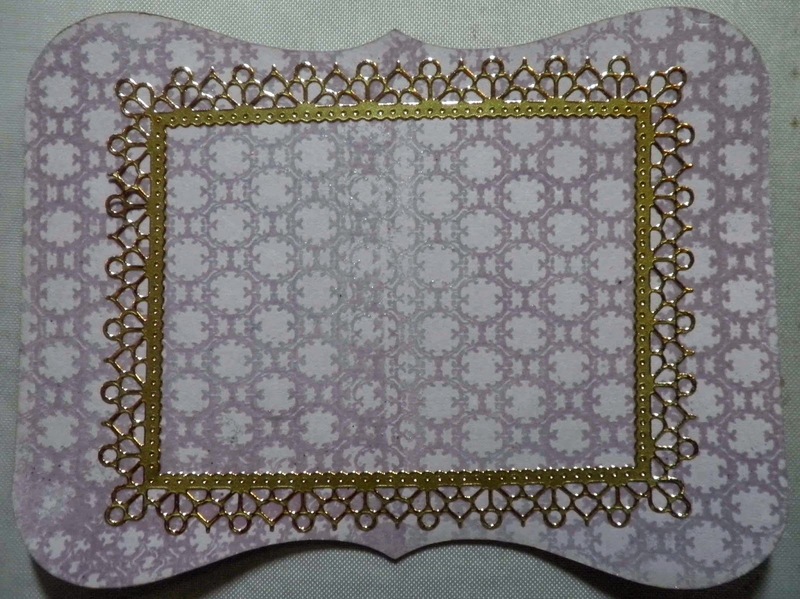 Adhere frame sticker over lavender layer. Now, to make the focal image. Use foam dots to layer Reddy die cut Roses together, following the easy numbered directions. I used tiny pop dots for dimension. Here is a close up of the layers. 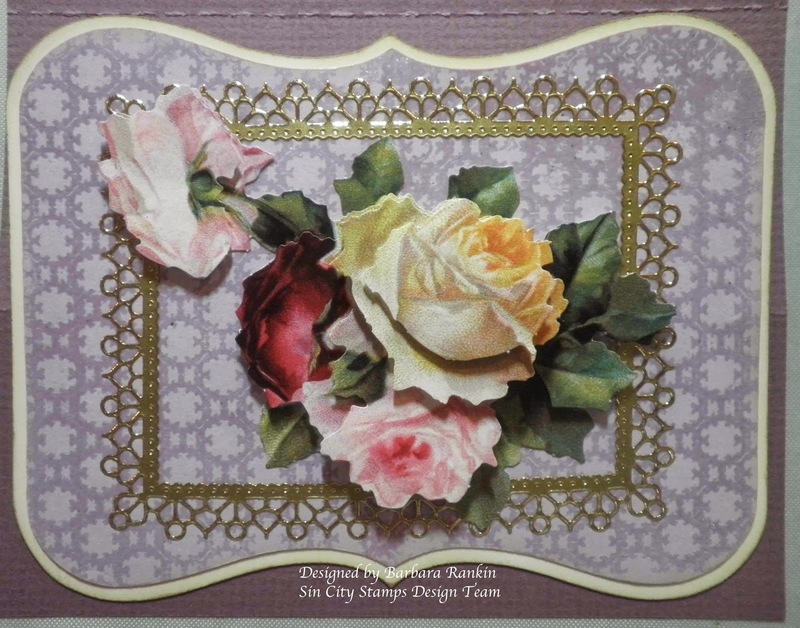 Adhere 3D roses to center of card front. 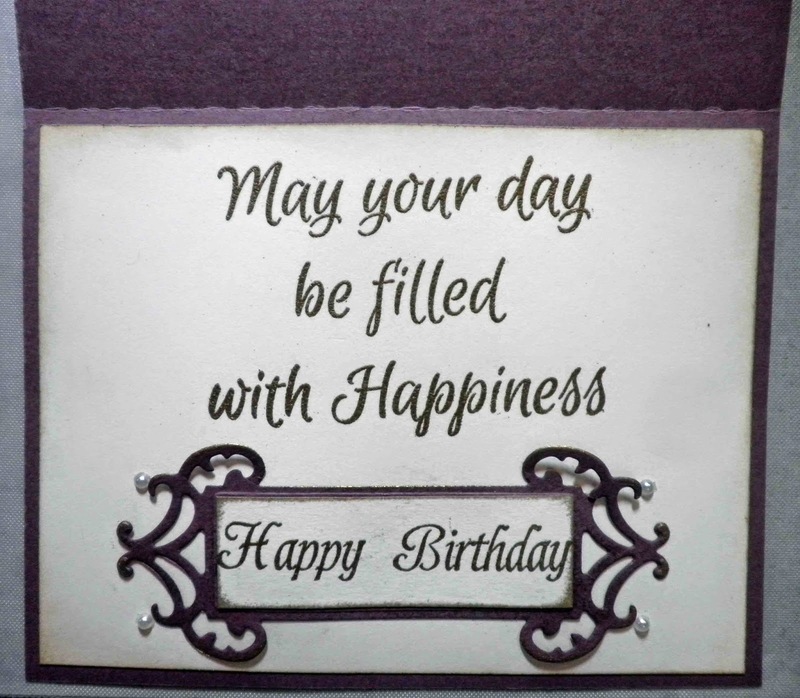 For the inside, I stamped Happy Birthday onto a scrap of Ivory cardstock with Versamark and embossed with gold detail embossing powder. Then I trimmed out the Happy Birthday piece using the die to make my pencil marks for cutting and edged that with Gold Encore metallic ink. 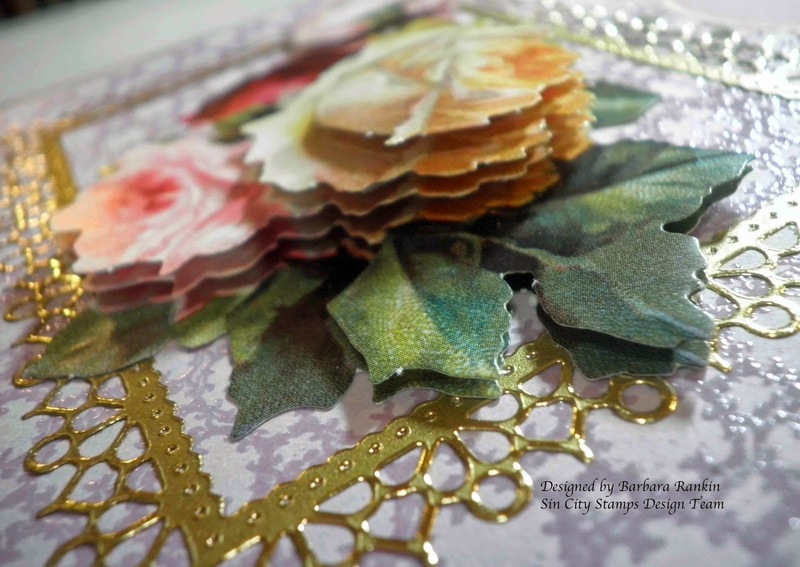 I used the Spellbinders die to cut out the fancy label from Vineyard, and edged it with Gold Encore ink pad and layered the Happy Birthday piece over center of die cut label. 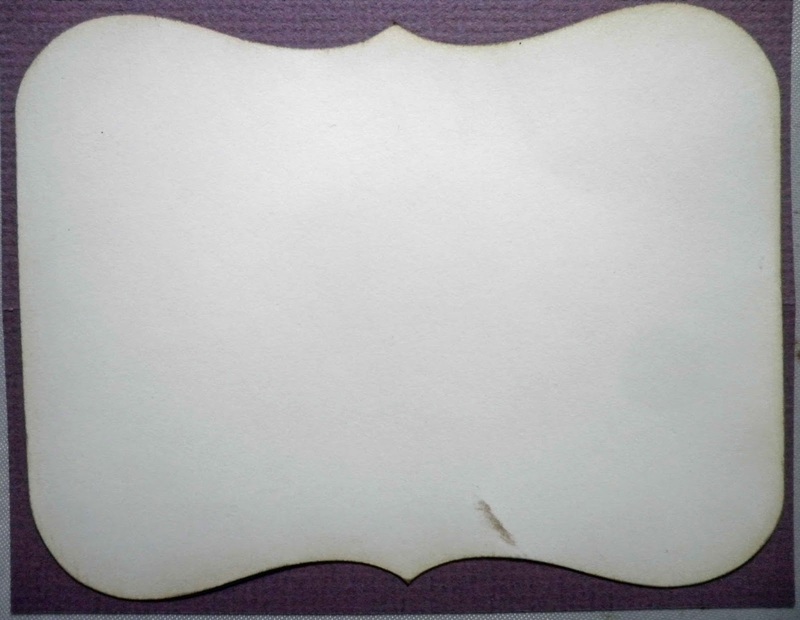 Trim a piece of Ivory cardstock to 4" x 5-1/4", edge with Old Paper distress ink. 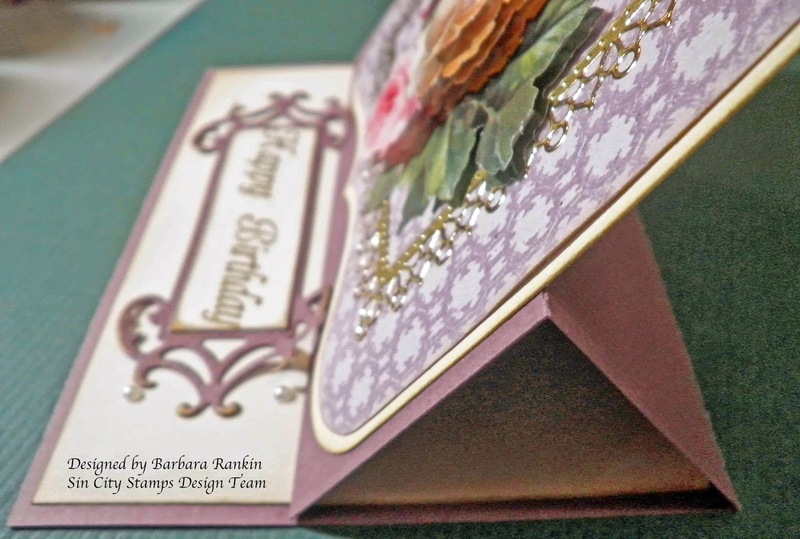 Stamp May Your Day be Filled With Happiness using onto ivory card stock with Versamark and gold detail embossing powder. Adhere to inside of card. Adhere label piece beneath sentiment. Apply glue only behind the central portion of the label. This will act as a stop for the easel. 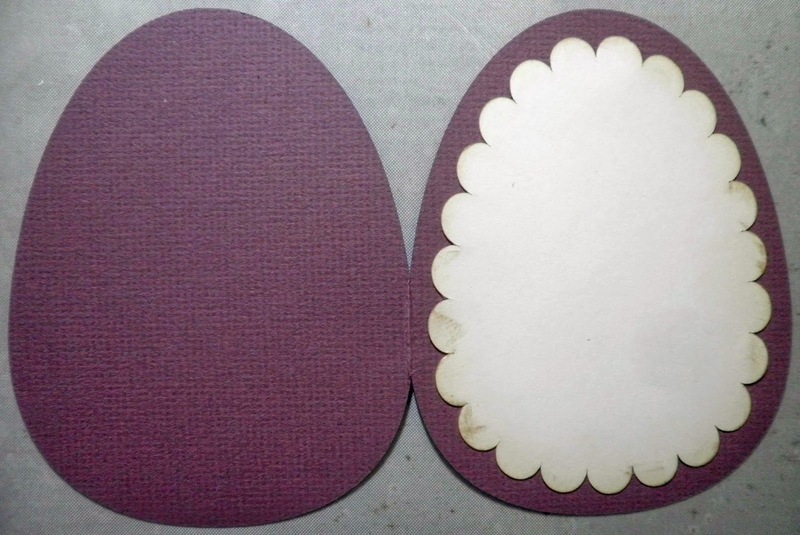 For my next card, I used the same papers and my Silhouette to cut out an egg shaped card. 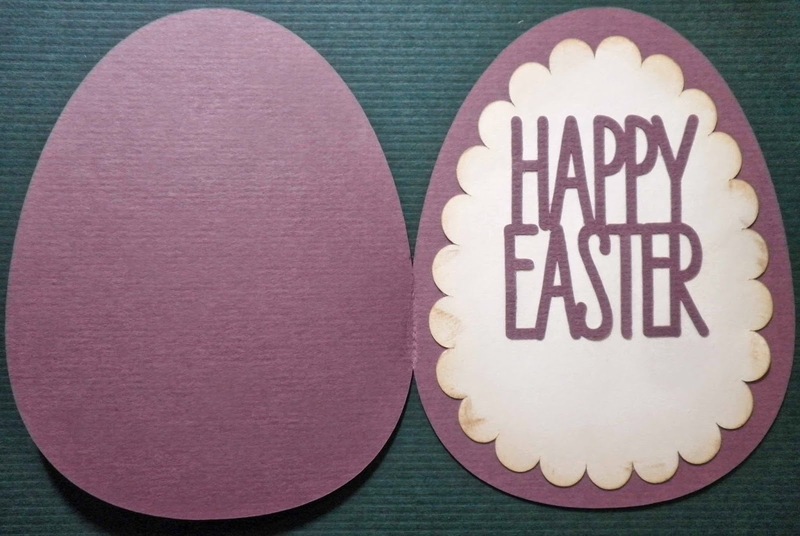 If you google egg shaped cards, you should be able to find templates online. 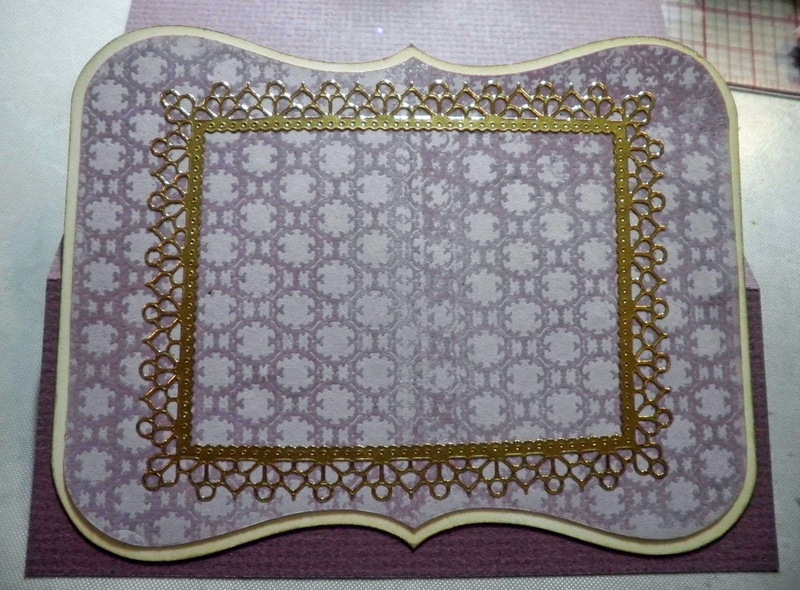 First cut out card base from Vineyard cardstock. 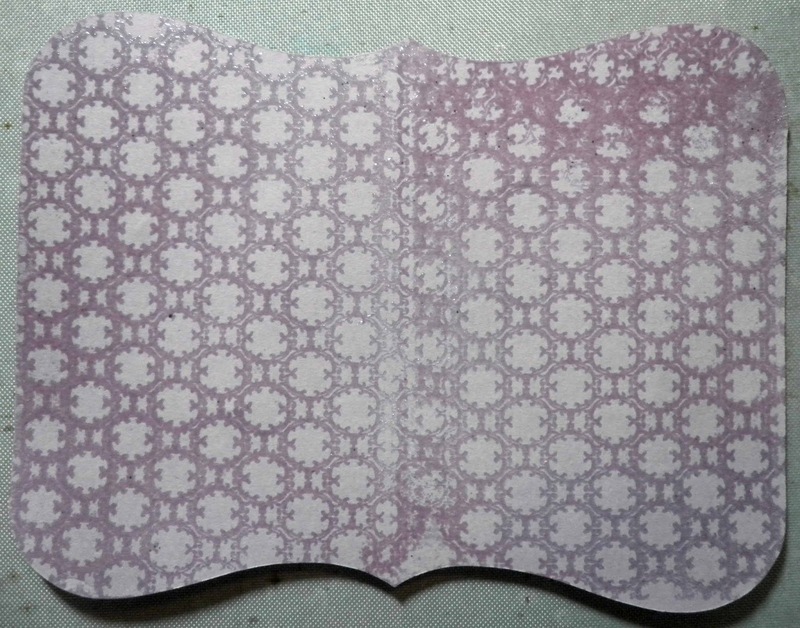 Cut out two scalloped layers from Ivory (1/4" smaller) and Lavender (1/8" smaller) than the card base. One Ivory piece will be used for the inside later. Edge Ivory card layer with Old Paper distress ink, adhere to card base. 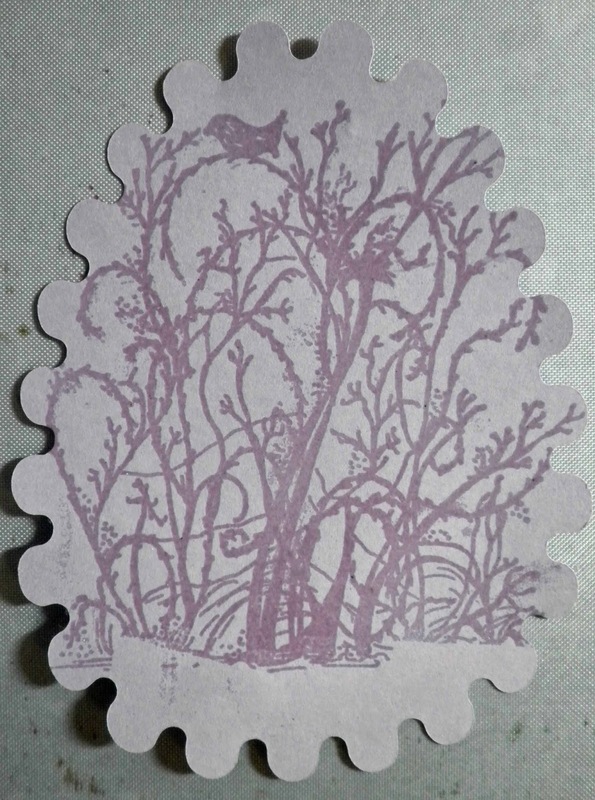 Stamp background image from Pam Bray's Fall Collection onto Lavender layer with Versamark ink and clear embossing powder. 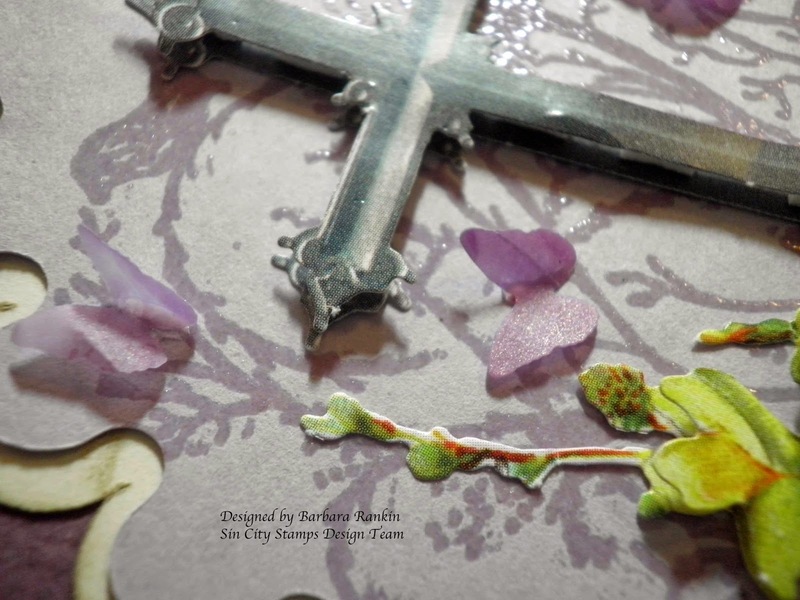 To make the focal image, layer all of your pieces as before, with foam dots. 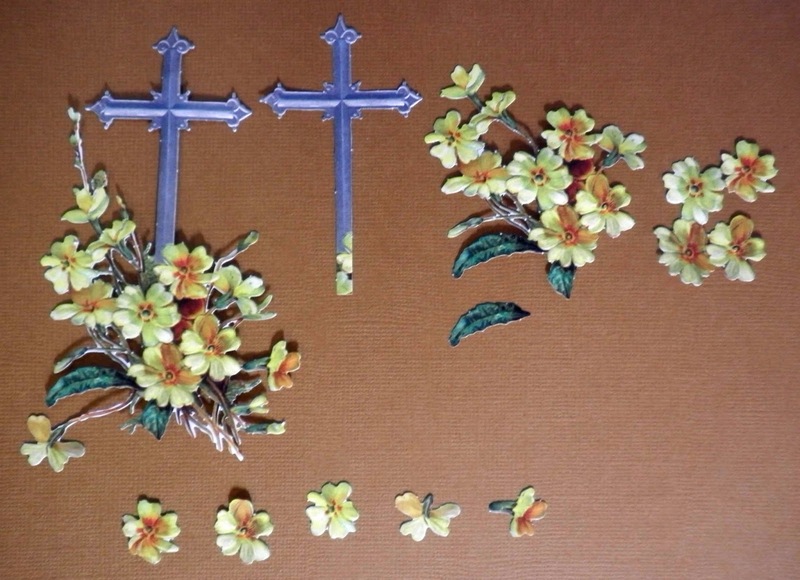 Here is a pic of the pieces for this one. And here is a close-up of the piece when completed. 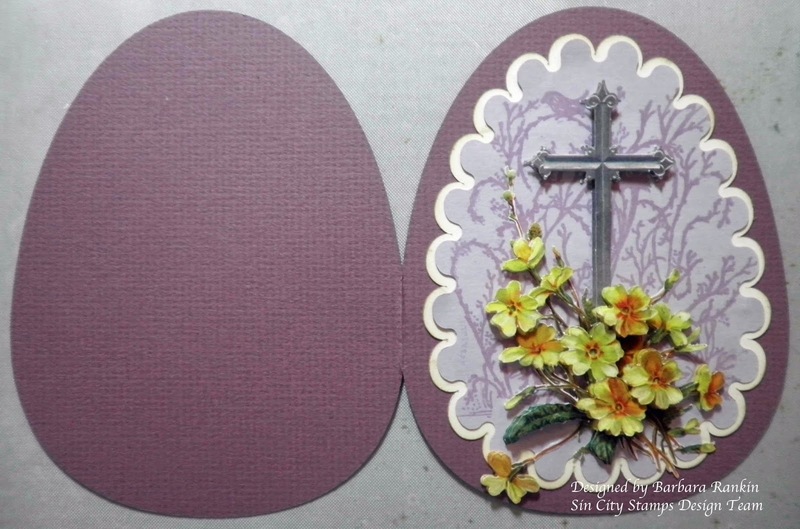 Adhere the second Ivory layer to the card inside and Happy Easter die cut over that. 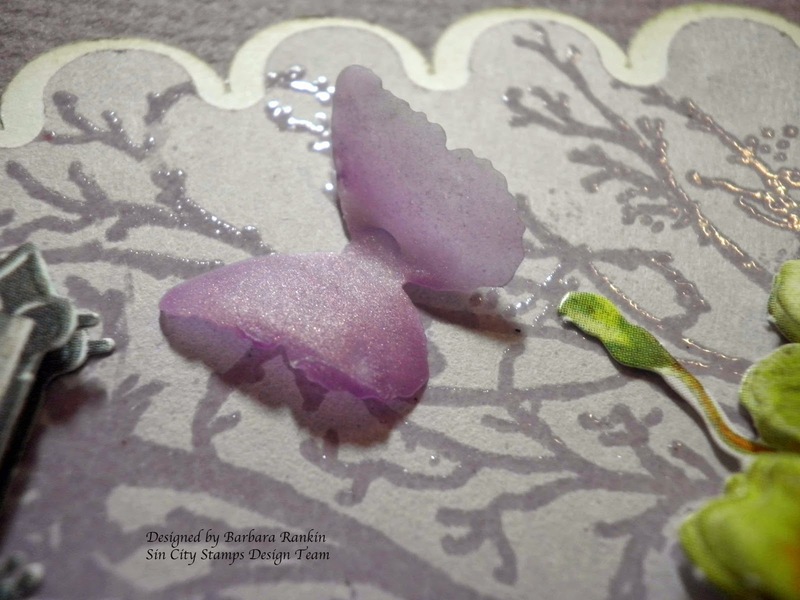 I still had these little butterflies on my desk that spoke to me and said, you are perfect for this card. 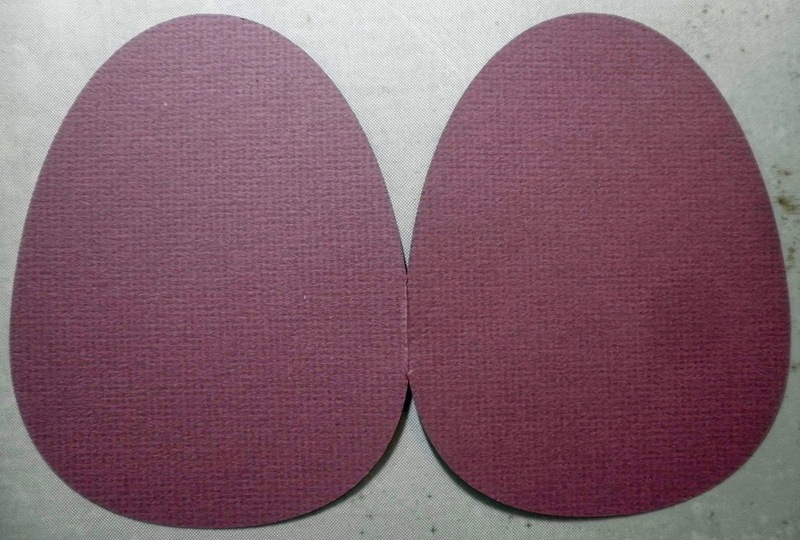 They are actually made from dried paint and punched out. You can visit my blog here to see how I made them. 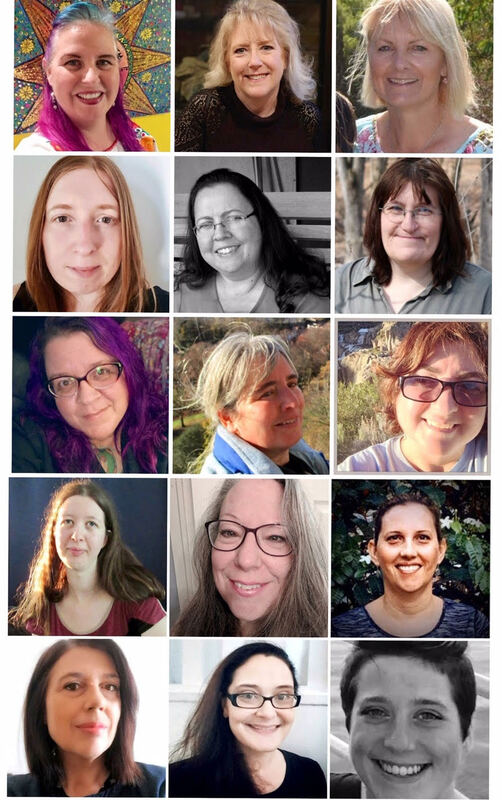 Here are a couple of close-ups of how pretty they look. I hope you enjoyed my cards today and will give these products a try. You can get all you need from both Sin City Stamps and Ecstasy Crafts to complete them and many more. Be sure to check out the blog this month to see what the rest of the design team are cooking up for.